In every market, FSB architects and designers take pride in creating spaces that not only meet clients’ functional needs, but also present an aesthetic that embodies who the client is and what matters to them. When determining that aesthetic, a client’s culture becomes a key consideration, and designers at FSB take care to listen and learn as they begin a new project. Architects and interior designers at FSB work to understand the culture of every client and incorporate it into their work, and Holuby said culture is a central part of the design work completed for their Native American clients. In order to appropriately incorporate a client’s culture into a project, designers and architects must first spend time researching, finding all the information they can about the client at the beginning of a project while keeping in mind that the information they find is often presented through the lens of someone outside the tribe. After background research, FSB hosts a visioning session with client leadership where they ask which aspects of culture ought to be expressed in the building’s design, and depending on the project, to the outside world. 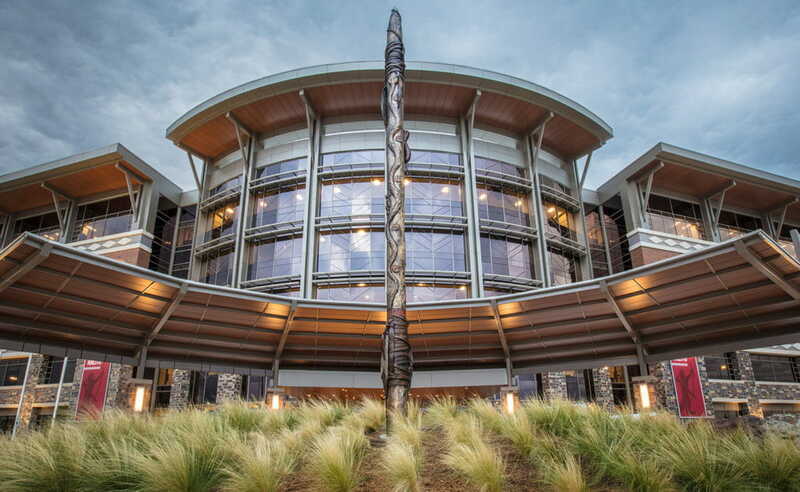 During the early stages of designing the Choctaw Nation’s new headquarters building, which opened in June 2018, Holuby said the tribe went above and beyond to immerse the FSB team in Choctaw history, art, clothing and meaningful symbolism, hosting a day-long program for the firm. “We were just soaking it all in and trying to retain as much as we could,” FSB Interior Design Manager Toni Brungard said. Brungard, the lead interior designer for the Choctaw project, said her notes from the cultural immersion day helped her to arrive at a design statement, a sentence referenced throughout the project make sure their decisions tie back to their original objectives. Our design objective is to celebrate and reflect on the culture and values of the Choctaw Nation by telling the story of the past, present and future through the use of symbolism, geometries and nature. Brungard said the Choctaw tribe’s veneration of nature led her team to develop five color schemes – Earth, Wind, Fire, Water and Sun. Every floor of the headquarters building had a different scheme, and the designers selected different patterns and textures to correspond with scheme. For example, on the ceiling of the Sun floor, the seal of the Choctaw Nation is backlit, with wood panels radiating outward creating a sun pattern. Holuby said that walking through the completed building, he is still amazed at the many subtle incorporations of the diamond throughout the design. The diamond symbolizes the diamondback snake, which is held in high esteem for Choctaws because if respected it will behave peacefully, but if pushed will strike. Some cultural themes represented in elements of the Choctaw headquarters’ design carry multiple layers of meaning for the tribe, for example the theme of family. From far back in the tribe’s history, family is at the center of societal traditions — a Choctaw motto is “Faith, Family, Culture”. Today, people will travel to Durant to meet with genealogy experts and discover or understand more about their Choctaw roots. The family theme is incorporated in a myriad of ways, in everything from depictions of a family tree in the café design, to more nuanced references in fire symbolism throughout the structure. Fire has long signified family for the Choctaw tribe, harkening back to days when family units gathered around a campfire. Brungard said once the headquarters were complete, she found her conversations with members of the tribe to be extremely rewarding. “Hearing that we incorporated their culture in a way that was elegant and respectful just made my heart feel so happy,” she said. While some tribes have intersecting histories and overlapping symbolism, every tribe is different, and for every project FSB prides itself on willingness to learn first in order to design projects that are uniquely meaningful to the client’s culture. For example, the firm recently completed a master plan for the Muscogee (Creek) Nation in the area surrounding their Tribal Capitol Complex in Okmulgee, Oklahoma. The plan was created to address current and future space needs, while developing the area to attract tourism through a cultural center and casino hotel. FSB underwent a similar cultural immersion into Muscogee (Creek) Nation culture, symbolism and traditions prior to beginning design work. 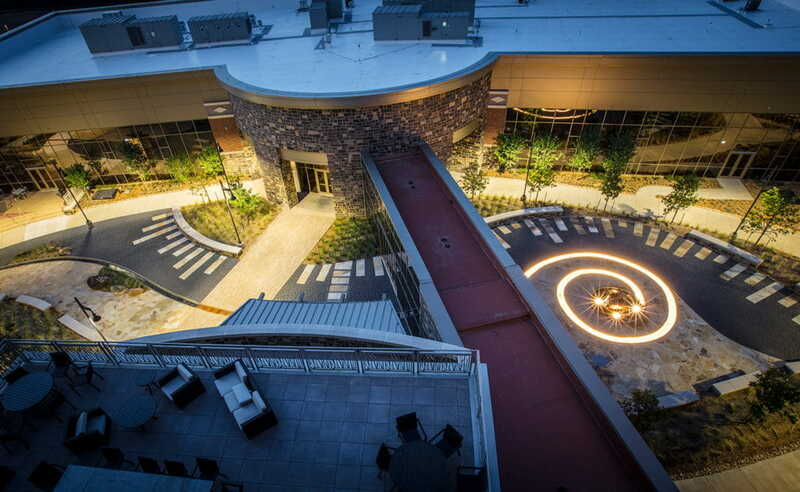 “Culture is so important to express in the exterior design, interior design and the site work,” Holuby said.